3D printing is arguably the most hyped technology of the decade. It should be noted that what started the hype wasn’t necessarily the technology itself (the first functional 3D printer was made in 1984) but rather its affordability, and in particular the democratization of use and understanding that comes with a low price point. What’s perhaps most exciting about affordable 3D printing (and, not to overlook its impact, the expiration of early 3D printing patents) is the promise of economical large-scale printing for the AECO industry. Case in point: In September of this year, a company called MX3D will, with the support of Autodesk, ABB, Delcam and other major industry players, robotically 3D print a steel bridge over a canal in Amsterdam. What the announcement of the MX3D Bridge shows is the industry has come to realize that scaling up additive manufacturing isn’t just about printing bigger, it’s about printing smarter. 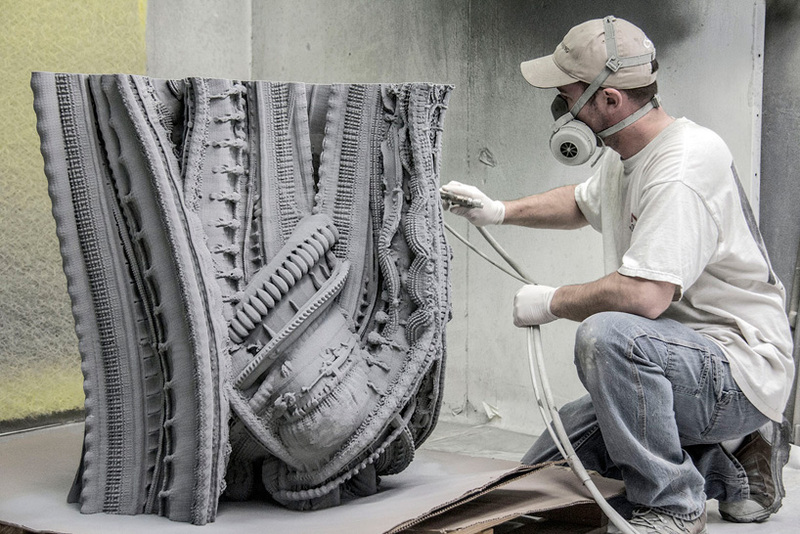 The MX3D bridge is, of course, not the first example of large-scale 3D printing. Noteable prior examples include printhead techniques like D-Shape (2012), which prints binder onto layers of sand, and Michael Hansmeyer and Benjamin Dillenburger’s Arabesque Wall (2014) which used a sand printing process by ExOne. Also of note are deposition-based techniques such as WinSun Decoration Design Engineering’s infamous feat of 3D printing ten homes in under twenty-four hours (2014), the printing process of which is essentially a scaled-up version of Dirk Vander Kooij’s Endless Process (2010) (sans the environmental rhetoric) and involves the controlled deposit of a cementitious material from an extruder nozzle. In the end, the difference between MX3D and these projects is that the latter were limited by build envelope and a two-dimensional printing method of stacked planes. Consequently, the visible seams between the individual blocks of the Arabesque Wall contrast harshly with its curvilinear baroque ornamentation. The Chinese houses avoid the seam issue by using a warehouse-sized gantry, but the increase in scale necessitates a proportional decrease in resolution. The process is incapable of the detail seen in Arabesque Wall and leaves behind unsightly print layer artifacts, and the building design leaves one feeling blasé if not downright depressed, although housing people affordably in a very short amount of time is a compelling enough argument to make beauty irrelevant. What the MX3D Bridge represents is 3D printing not limited by incremental XY plane printing, but possible within the articulated joint range of synchronously programmed industrial robotic arms on tracks. In other words, a virtually limitless build envelope without negatively impacting print resolution. Imagine being able to drag a pencil through the air and it creating a physical structure (wait, that’s a thing!) – that’s how incredible this new construction technology is. If the project is executed as planned, it will be virtually indistinguishable from magic. While certainly innovative, the MX3D Bridge is not the first instance of freeform robotic 3D printing. The project is built on the shoulders of a number of fascinating prior projects and experiments. MATAERIAL (2013), for instance, is a project that resulted from collaborative research between Petr Novikov, Sasa Jokic, and Joris Laarman Studio at the Institute for Advanced Architecture of Catalonia (IAAC) that uses a patent-pending process called Anti-Gravity Object Modeling to instantly harden the 3D printed material as it’s being deposited in mid-air. In Phantom Geometry (2012), a Gehry Prize-winning project at Los Angeles’ SCI-Arc by Kyle and Liz Von Hasseln under advisors Peter Testa and Devyn Weiser, photosensitive resin is selectively polymerized using a Digital Light Processing (DLP) display. 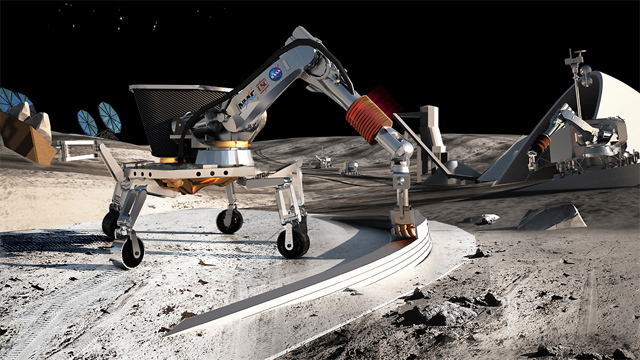 And this isn’t just Rococo thesis frippery: Researchers at USC won a NASA grant to work on their proposal for Contour Crafting a lunar settlement. And we’d be remiss to overlook the speculative thinking that paved the way for the real work. French architect François Roche’s (n)certainties labs (2006 – present) taught at Columbia GSAPP and a number of other top universities have been speculating on robotic and robotically deposited material narratives in architecture for almost a decade. Now, of course, none of this is to say that industrial robotic arms are the be-all and end-all of 3D printing in architecture. Obvious impediments to their wide adoption in AECO is both the working range and precision of jobsite robotics. The Pike Loop (2009) project designed by Gramazio & Kohler and commissioned by the Storefront for Art and Architecture was an early attempt at in situ robotic construction. The Swiss duo used their R-O-B mobile fabrication unit, a modified freight container that could be periodically repositioned, to build a looping brick wall on a pedestrian island on Manhattan’s Pike Street. While impressive, the project shows how far we still need to go for truly mobile, all-terrain robotics in construction. Considering that industrial robotic arm technology has been carefully developed and incrementally refined over the last eighty years toward repetitive prefabrication, we shouldn’t be surprised that the transition to jobsite robotics and mass customization isn’t a particularly natural one. As an industry, we face a tough decision on whether in situ robotic construction requires an new robotics paradigm altogether, or whether we can augment existing industrial robots with other emerging construction technologies. Steven Keating, John Klein, and Nathan A. Spielberg have been working under Neri Oxman in the MIT Media Lab’s Mediated Matter group on a compound robotic arm system called Digital Construction Platform, or DCP (started 2012). The DCP system handles gross robotic arm positioning with a 5-axis Altec hydraulic mobile boom arm and fine positioning with a 6-axis KUKA robotic arm attached to the end of the boom. The entire system is mounted onto a truck and has an eighty foot reach, a 1,500 pound lift capacity, and a twenty pound manipulation payload. Couple this with advances in autonomous vehicles as seen from the likes and Google and Uber, and developing construction technologies like drone-assisted driverless dozers (Komatsu already has an Autonomous Haul System deployed on mining sites) and you’ll have a fully automated jobsite straight out of a science fiction movie. But today’s science fiction is tomorrow’s reality, and the ambitious MX3D project is an exciting reminder of this. Whether or not the MX3D project is a success, building-scale 3D printing and autonomous construction are imminent, and as such we can expect our current notions of labor, collaboration, and design to be supplanted, so let’s start planning for it now before it’s out of our hands.